Contributions included poetry by Sara Borschow, George Ebey (Sappho), Lou Goldstone (Fantasia), James Russell Gray, Arthur Louis Joquel II (as "Fywert Kinge"), Ray Karden, Arthur Kennedy, Ben King, Banks Mebane, Sylvia Moore, and others. 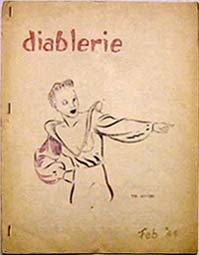 Contributions of prose were by Robert Bloch, Charles Burbee (Shangri L'Affaires), John F. Burke, Eddie Clinton, George Ebey, Joe J. Fortier (Starlight), Lou Goldstone, Ray Karden, Francis T. Laney (The Acolyte), Walter Liebscher (Chanticleer), Marijane Nuttall (as M.J. Nuttall), E. Hoffman Price, Milton A. Rothman (Fantasy Fiction Telegram, The National Fantasy Fan), Bob Tucker (Le Zombie, Science Fiction Newsletter), Graph Waldeyer, and Harry Warner, Jr. (Horizons). This page was last modified on 15 March 2015, at 08:02.